Keynet is the Brand name given to the MPT1327 infrastructure based upon Radio Systems own Key equipment. There are currently three configurations, Keynet 2, Keynet 3 and Keynet 4, each with its own technical and commercial attributes. 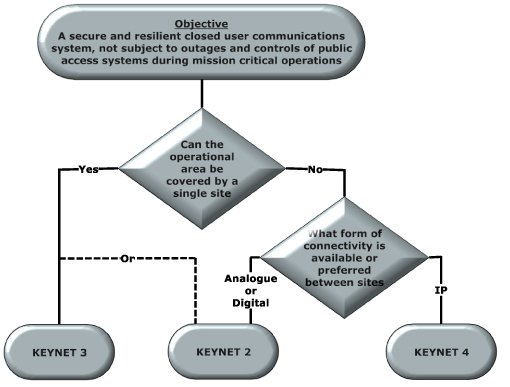 The drawing shows a simple Keynet selection flow chart. Downloads are available in Marketing & Technical Support describing each Keynet and other infrastructure options in detail but each is introduced briefly below. This is a single MPT1327 site, for example serving a building construction site. 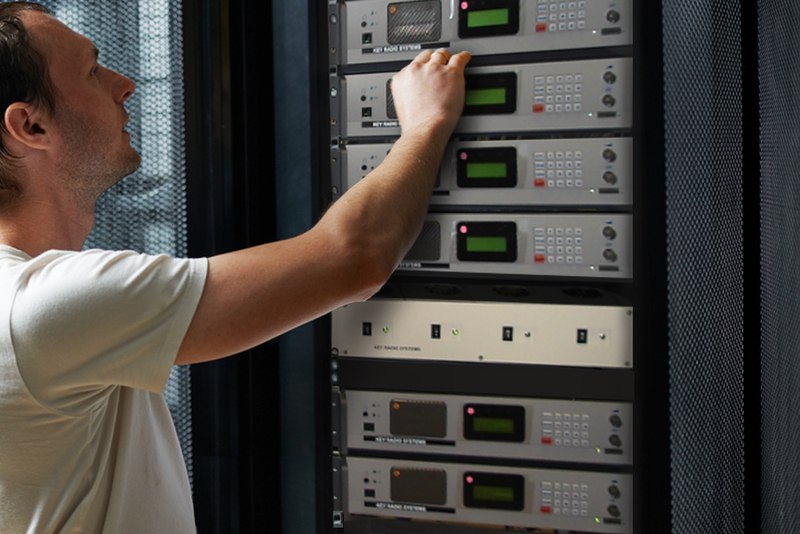 The number of radio channels can be scaled from a single to multiple channels, providing one to one and Group calling communications for up to many hundreds of site personnel. This can consist of a single or multiple sites. Where enhanced facilities are required from a single site, e.g. asset or personnel tracking, Keynet 2 provides the additional software functionality over Keynet 3. Where a single site will not cover the operational area required, Keynet 2 can have multiple sites. Linking between sites to enable intersite communications can be by analogue or digital, e.g. Kilostream land lines or microwave circuits. This is similar to Keynet 2 except that intersite links use IP connectivity. Where reliable business grade DSL connectivity is available, this can facilitate substantial cost saving over the alternative leased land line option. In addition to the intersite links, IP connectivity can be employed for other interfaces into Keynet 4, e.g. IP connected Computer Aided Despatchers and SIP telephone exchanges.